Reconstruction of the Late Permian Youngina capensis by Brad McFeeters. The Neodiapsida is the clade containing the crown group of living diapsid reptiles (the Sauria) together with the basal 'Younginiformes' (Senter 2004). 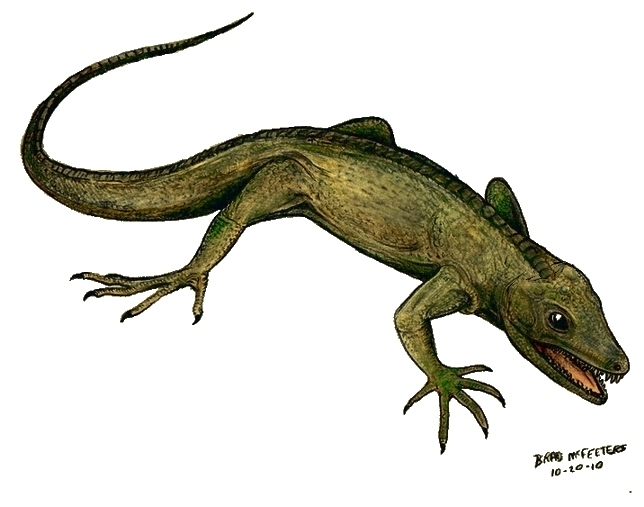 The Younginiformes are a group of lizard-like reptiles known from the late Permian and early Triassic whose monophyly relative to Sauria is uncertain. One group within this assemblage, the Tangasaurinae, was adapted to a freshwater aquatic habitat, with webbed feet and a laterally compressed tail. Synapomorphies (from Senter 2004): posterior trunk ribs holocephalous; maximum of 17 dorsal vertebrae; pronounced olecranon process absent. [DS89] Dundee, H. A., & H. M. Smith. 1989. Nomenclatural eponym endings revisited. Systematic Zoology 38 (3): 279–283. [E88] Evans, S. E. 1988. The early history and relationships of the Diapsida. In: Benton, M. J. (ed.) The Phylogeny and Classification of the Tetrapods vol. 1. Amphibians, Reptiles, Birds pp. 221–260. Clarendon Press: Oxford. [NB17] Nesbitt, S. J., R. J. Butler, M. D. Ezcurra, P. M. Barrett, M. R. Stocker, K. D. Angielczyk, R. M. H. Smith, C. A. Sidor, G. Niedźwiedzki, A. G. Sennikov & A. J. Charig. 2017. The earliest bird-line archosaurs and the assembly of the dinosaur body plan. Nature 544: 484–487. [S04] Senter, P. 2004. Phylogeny of Drepanosauridae (Reptilia: Diapsida). Journal of Systematic Palaeontology 2: 257–268. Last updated: 11 August 2017.